On St. Patrick’s Day 2010, this Meehan's was born in part of an old downtown building. : Crafted from part of an old Macy’s and the adjacent movie theater, the spaces within this downtown Meehan's outpost have been seriously reconfigured, giving it the look of having been procured lock, stock and barrel from Ireland. Some of it, though, such as the antique flooring, came from south Georgia. The menu fields everything from local comfort fare (fried pickles and chicken tenders) to nachos and blackened salmon. We recommend the "Chip Shop Curry," fried potatoes topped with curry sauce, and the colcannon fritters, although we think they'd be better made with cabbage instead of kale. Classic Irish fare includes bangers and mash, a stick-to-the-ribs Irish stew made with Guinness and lamb, shepherd's pie prepared with lamb, and Irish breakfast with soda bread, beans and black-and-white pudding served all day. 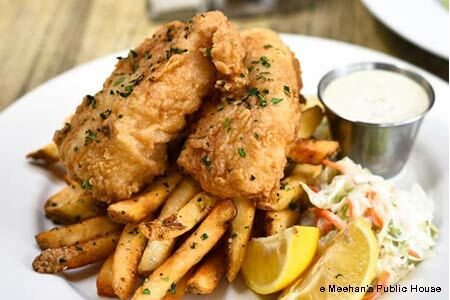 Fish ‘n’ chips are okay, but the tartar sauce is thin, although flavorful. Food 101’s famous meatloaf also is on board this menu, as that restaurant is a sister establishment. For dessert, hope that the Jameson Whiskey bread pudding is on offer. Quaffs of choice are beer but there’s a good list of Irish whiskeys and single malt scotches as well. Other locations.